As seasons go, Autumn is not my favorite. As much as love the fall colors nature gives us, and the mostly moderate temperatures, and I do, I am already dreading the months of cold ahead. I am only momentarily charmed by snow, fear the ice, dislike having to wear so many extra clothes, and would like longer days. 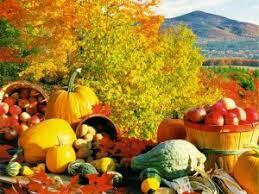 One thing I do get excited about in Autumn, though, are three Fall Fruits – Cranberries, Pomegranates, and Persimmons. They all have relatively short seasons, so I like to buy them fresh often and enjoy the special gifts they bring for palate and good health alike. These little red marbles are grown mostly in the upper Midwest and are antioxidant powerhouses. Their phytonutrients help promote good heart health, inhibit cancerous cell growth, and counter premature aging. A number of compounds peculiar to cranberries are responsible for the unique role of this fruit in keeping the urinary system healthy. Cranberries also combat bacteria and viruses in the kidneys, bladder, and urinary tract by preventing bacteria, such as E coli from adhering to the walls of the urinary tract, so they are ideal for people with urinary problems, such as cystitis. They can also help chesty coughs and sore throats. 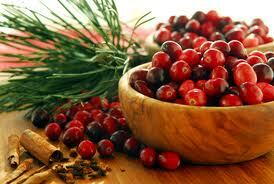 Fresh cranberries (the best kind to buy, and organic, too), will last for about two weeks in the refrigerator. Frozen ones will keep about a year, so I like to buy extra in the Fall so I can enjoy them year-round, though less often in other seasons. They are tart, no doubt, and combine well with other fruits in sauces, relishes, and in my favorite way to enjoy them – green smoothies. A cautionary note – cranberries contain tannic and oxalic acids, which, if over-ingested, can contribute to the formation of kidney stones and inhibit the body’s absorption of iron and calcium. 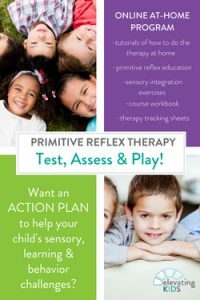 So the best practice is to enjoy them more than at holiday dinners, in moderation through the Fall, and occasionally during the rest of the year. Pomegranates are sweet, sour, cooling and beautiful. They are rich in vitamin C and potassium, and also contains phytoestrogenic compounds, which means that eating a half a pomegranate a day can improve fertility. Recent studies of this high-antioxidant fruit suggest that its juice is three times more potent than a similar quantity of red wine or green tea. A daily glass may reduce the risk of heart disease thanks to its tannins, polyphenols, and anthoocyanidins. These elements work by improving the function of the blood vessels and reducing hardening of the arteries, as well as reducing blood cholesterol levels and high blood pressure. Research suggests that pomegranates are great for prostate health and may slow the growth of prostate and other tumors. 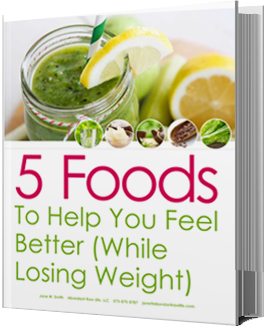 They may also be helpful for treating some symptoms of the menopause. 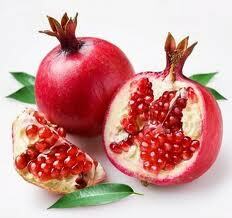 It’s best to keep pomegranates in the refrigerator, which will help them to last about 3 months. At room temperature they will only last a few days. There are pomegranate juices on the market these days, to be sure. I prefer to leave the seeds whole, both to preserve the natural fibers, (always a good thing for bodies), in green smoothies, and their brilliant festive colors and crunch on salads and relishes. Opening a pomegranate can be a challenge. I have found that the best way is to quarter the fruit, then soak the cut pieces in a bowl of water for an hour or so. This will soften the membrane so that with a little pressure you can apply, turning the quarter inside-out, the seeds will release easily and sink to the bottom of the bowl, leaving the white pulp to float at the top. 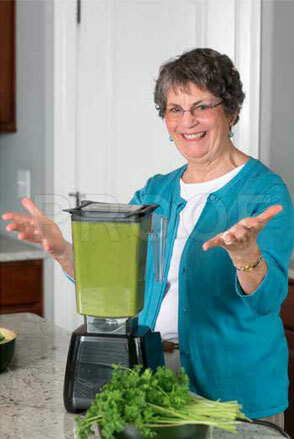 Then, skim the pulp pieces off top of the water, rinse and drain the seeds, and enjoy. A caution – this method works very well if you keep your hands and pomegranate quarters under the water as you’re working with them. And if anyone has a better method for freeing those sometimes-stubborn little seeds from the fruit, let me know. Freeing them is definitely worth the effort – in nutrient value, beauty, and taste. People who live in warmer climates than I do see persimmons much more often than I do. They are a real treat for a few weeks here in the Midwest, so I try not to miss them! These orange beauties are sweet, astringent, and cooling. The tannins they contain account for the astringent flavor, but as they ripen that astringence diminishes considerably. 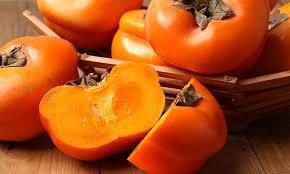 Persimmons help tonify the moistening fluids of the body and especially favor the large intestine and the heart. They lubricate the lungs, strengthen the spleen and pancreas, improve energy, and contain enzymes that help to break down damaged cells and foreign microbes. Persimmons have been used to treat bronchitis, cough, diarrhea, dysentery, goiter, hangover, hemorrhoids, hiccoughs, hypertension, mouth sores, stomach distress, and ulcers. They are best harvested after a frost. They should be firm and capped with a green stem. They like to ripen at room temperature, which they do relatively quickly. The ripening can be hastened by putting the persimmons in a paper bag along with some ripening bananas. Persimmons are delicious all by themselves. They also enhance salads, green smoothies, and can be made into chutneys, puddings, and pies. Do treat yourself to these 3 Fall Favorites…they won’t be around long.